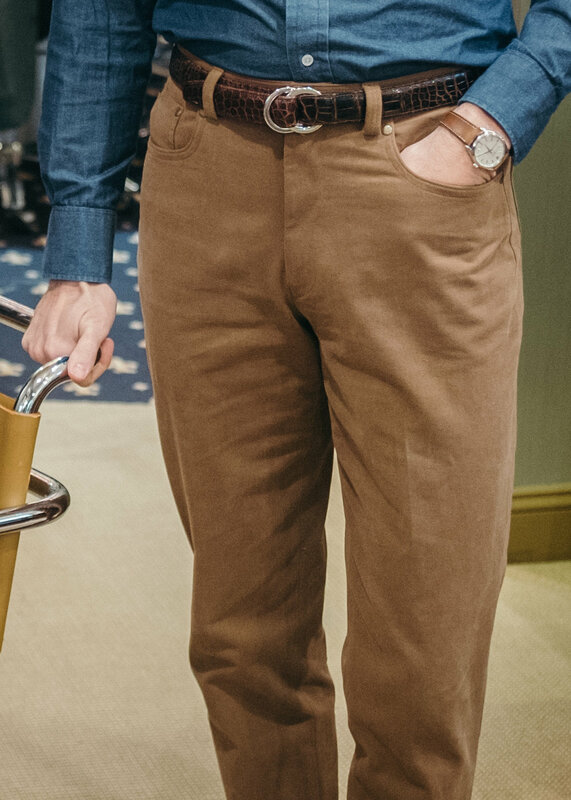 Responding to a client’s request for a pant that resides somewhere between jeans and typical odd dress pants, this past Fall we began offering our take on the classic five-pocket. The style is of course born out of the classic jeans cut, but we like making them in a variety of unexpected fabrics. Over the Winter, a couple of our favorites were a velvety brushed cotton moleskin, and heathered corduroy with a little bit of stretch. It’s just the right pant to wear a little more casually, with a knit or soft tailoring up top. Moving into warmer weather, on the dressier spectrum we like them in lightweight cotton gabardine as a more refined chino. However, we’re also stretching the boundaries of what people think about when they consider the humble five-pocket: wide-wale seersucker in featherweight cotton that plays best in the heat, bolder stripe linens that will fit right in to their eventual home in Miami Beach, and solid marled linens with a touch more weight so they’ll breezily rumple rather than wrinkle. On the fit, we suggest a touch higher rise than you’ll find in off-the-rack five-pockets. They’ll sit a little closer to the natural waist, which we think is just a bit more elegant and has the added benefit of pairing well with tailoring if you’re so inclined. The legs of course taper like a jean, lending a trimmer silhouette. Take a look at some of the photos below, and give us a call with your own ideas!